I know that in the final countdown to Christmas, I should be posting more festive food – ideas for vegetarian Christmases and all that kind of stuff but we are flying across the country to Perth on Christmas day (just in time for lunch), so apart from baking up a storm of cookies, I’m really a bit out of the loop on the buying and preparing celebratory food. In our house, it’s all about eating down the refrigerator, trying to get rid of the last of the tofu, baby tomatoes and eggs before we take off across country! 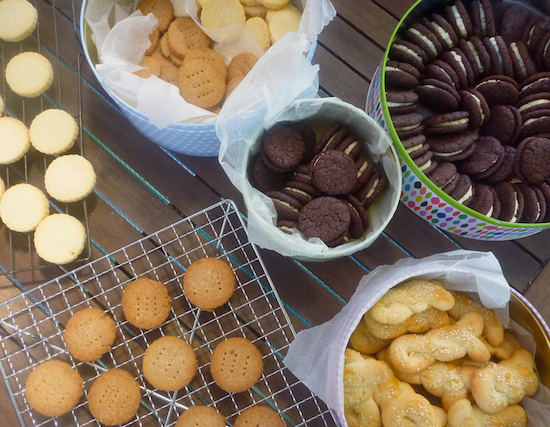 On the cookie front, I usually cook my standard chocolate sables and lemon shortbread but I decided to change it up a bit this year and have been baking Oreos (everyone loves a homemade Oreo), paschalina koulourakia (Greek Easter biscuits – these are too good not to have all year round), Graham crackers (maybe a odd choice for a Christmas cookie but these ones from Martha Stewart are so good! ), and these vanilla shortbreads from Little Expat Kitchen, which are a good not-too sweet shortbread by themselves, but slide into ‘food-for-the-Gods’ territory when filled with dulce de leche to create Alfajors. But, back to more immediate problems of fridge clearing eating. 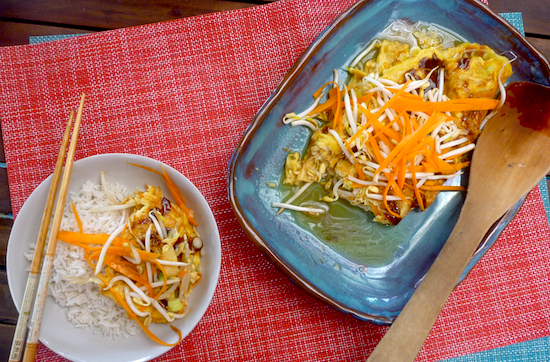 There’s nothing like this simple stir-fried omelette to use up a few eggs. A few months back, I developed a nostalgic craving to make egg foo yung at home. Egg foo yung is classic American–Chinese dish and is not something I ate as a child but I’ve seen it on so many movies and TV shows and it is so much part of my popular culture experience, it was almost like I had eaten it all through my childhood. I did a Google search for vegetarian egg foo yung recipes and looked up countless recipes for cross comparison, realising that egg foo yung is basically an omelette covered with a cornstarch thickened, chicken stock-based brown gravy. After all that research, the reality of egg foo yung couldn’t really compete with the imagined egg foo yung of my childhood, so I kind of lost the nostalgic urge to re-create it. What I also realised from all my research is that egg fu yung is remarkably similar to this free-form Chinese omelette I make at home. The sweet and salty dressing made from vegetarian oyster sauce, vinegar and sesame oil drizzled over the omelette, is a bit like a hassle-free version of egg foo yung‘s brown sauce. In fact, this stir-fried omelette is probably a bit more authentic version of egg foo yung. If you eat eggs, this is an excellent thing to have in your repertoire: it makes for a delicious quick and easy dinner for two, or as a side dish in a more elaborate meal. I often make one of these omelettes and serve it with some greens for a complete and satisfying meal. I love the crunchy freshness of the bean sprouts and carrots in this version, but you can use whatever vegetables you have around – shredded cabbage, mushrooms, tomatoes are all good substitutes – or you can leave out the vegetables and make a simple omelette with the basic aromatics of spring onions and ginger. Cut carrot into fine lengthways strips using a vegetable peeler then finely Julienne these strips. Combine oyster sauce, sesame oil and malt vinegar and set aside. Put eggs, ginger, spring onions, salt and soy sauce in bowl and beat together with a fork. Stir through bean sprouts and most of the carrot (leave aside a handful of carrot for garnish). 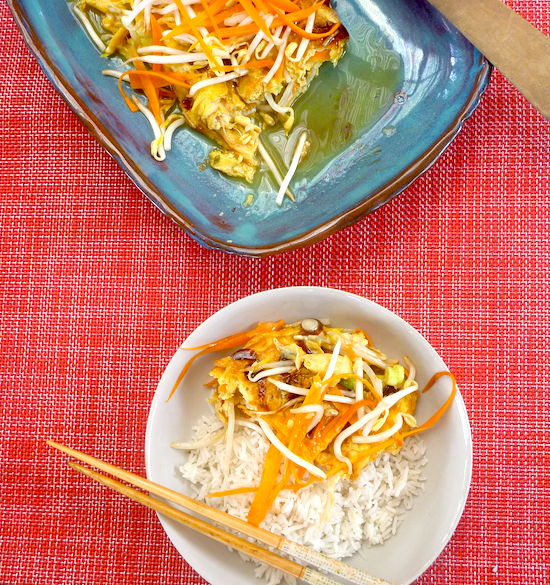 Remove omelette to serving plate, drizzle oyster sauce mixture over top, scatter over bean sprouts and carrot and serve immediately. *Vegetarian oyster sauce is made from shitake mushrooms, and is a good, umami rich alternative to ordinary oyster sauce, as well as being suitable for vegans and vegetarians. There seems to be quite a few ex-pat Western Australians in Tassie – refugees from the heat? I hope we don’t fly into a heatwave on Christmas day. And a lovely christmas to you too Lucy. Thank you and a happy and lucky New Year to you too.